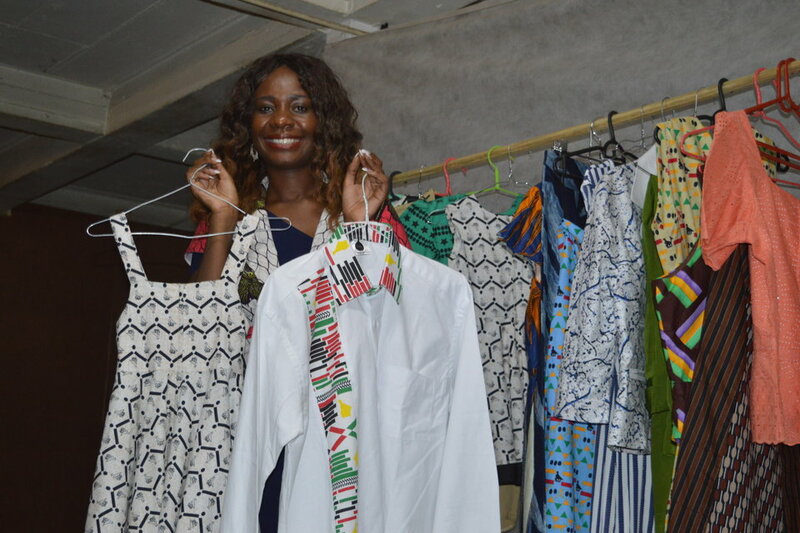 The British embassy in Harare profiles Celia Rukato, a designer who typifies so many young Zimbabweans' creativity and innovation in the face of challenges. What strikes you first when you walk into Celia Rukato’s design studio is the green armchair. It’s an old-fashioned wing back, upholstered in an olive-coloured fabric. It’s the kind of chair you’d expect to see in your grandmother’s front room. But here it is in a dark concrete basement in Harare, underneath a strip light and right next to a rack of bright African print dresses dashiki shirts. The juxtaposition is both surprising and perfectly right. Designer and fabric-creator Celia’s dream was simple, she says. Simple, but daring. When she came back home to Zimbabwe from Nigeria and Ethiopia in 2014, she noticed something straight away. “We were always dressed in East African outfits, she remembers. “Zimbabwe just didn’t have an identity in terms of dress.” Celia spent part of her childhood across the border in South Africa, where she was fascinated by the elaborate, tailor-made clothes her mother frequently brought back from business trips to Nigeria. Encouraged by her family, the economics and finance graduate set out to design cloth and clothes that would be recognisably Zimbabwean. The company is called Chjaa. It wasn’t an easy journey. I’ve bumped across a potholed road to get to Celia’s design workshop, a 40-minute drive from the British Embassy. The studio is in the industrial suburb of Mbare. Celia’s sister Wadeisor comes out to greet me, modelling a Chjaa jumpsuit in an orange fabric printed with mint-green suns. Pushing through a piece of plain cloth that serves as a curtain, Celia takes me to see her fabric being printed. Under the stark lighting, two workers are slapping black paint onto a dining-room-table-sized piece of plain white fabric. A bucket of thick red paint sits on the cement floor. Drying on the table is a piece of cloth printed in with a blocked-out bird, the iconic Zimbabwe fish-eagle that’s carved into the ruins of Great Zimbabwe, the UNESCO World Heritage site in the south of the country. 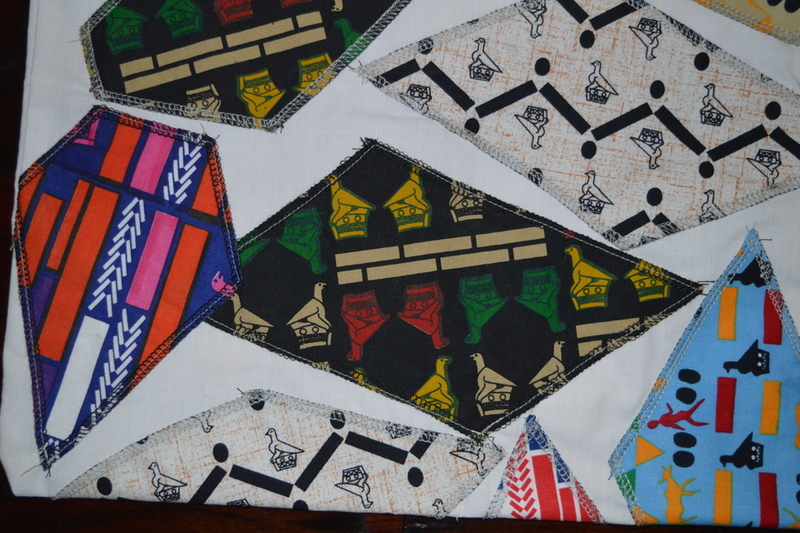 The Zimbabwe bird motif recurs time and time again in Celia’s designs. “The Zimbabwe bird is well recognised now,” she says. 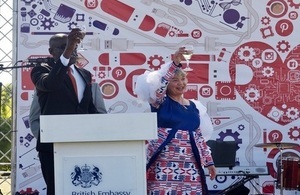 Celia dreamed up her striking bird print for Britain’s ambassador Catriona Laing for last year’s Queen’s Birthday Party – a blue, red and white fabric printed with the Zimbabwe bird. It was a clever way of bringing both Zimbabwe and Britain together. Our theme was innovation, creativity and technology and I wanted to reflect that in my own dress Celia has great ideas. She took the brave decision to come back home to pursue her fashion passion. But times have been tough in Zimbabwe. I hope I was able to help promote her through what I wore at key events – dresses that showcase Zimbabwe-UK connections. Celia wasn’t the only designer showcased by the UK at last year’s Queens Birthday Party. Tafadzwa Moyo of the up-and-coming Kiddhunta stable brought along his models too. Kiddhunta, by the way, is growing: in December it opened its first shopping outlet at Chisi Walk. Tafadzwa is taking Kiddhunta down to South Africa’s Menswear Week in Cape Town in February, where he’ll be proudly rep-ping the possibilities that Zimbabwe and Zimbabweans are so keen to embrace.